J.R.R. Tolkien is best known as the creator of Middle-earth, the setting of The Lord of the Rings and The Hobbit. 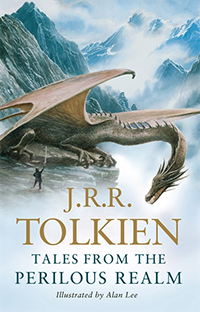 But, did you know that he wrote other stories that don’t take place in Middle-earth? In addition to being a fantasy author, Tolkien was an academic. He wrote modern translations of Sir Gawain & The Green Knight and Beowulf as well as the narrative poems The Legend of Sigurd and Gudrún, based on Norse mythology, and The Fall of Arthur, inspired by the legend of King Arthur. Roverandom is the story of a dog who is turned into a toy by an angry wizard and recounts his adventures as he searches for a way to undo the spell. Farmer Giles of Ham is an accidental hero, who must deal with a dragon who has invaded his village. Smith of Wootton Major is the tale of a blacksmith who, after eating a magical cake, is able to enter the Land of Faery. Leaf by Niggle is a short story about a painter struggling to finish his greatest work. The Adventures of Tom Bombadil is the only selection in this book related to Middle-earth. It is a collection of poems written by Hobbits, such as Bilbo Baggins and Sam Gamgee. I have discovered that Tolkien is a fun and creative storyteller, in all forms. If you’ve only read his books based in Middle-earth, I highly recommend checking out his other stories. Coyote (12) travels with Rodeo (her father, but don’t call him that) in a refitted old school bus. They go where any whim takes them and only think of the future. One day when Coyote talks to her grandma, she learns the park in their old neighborhood is going to be leveled to become housing. Now Coyote must get home, somewhere Rodeo will not go, so she will trick him into it. She must retrieve the memory box she, her sisters and her mom buried in the park five years ago. They are in Florida and need to get to Washington state in four days, without Rodeo realizing where they are going. Along the way they give some other travelers a lift and an interesting fellowship develops. First, she finds a kitten who is unusually quiet and seemingly knowing about what humans need, a bit like Coyote herself. She invites Lester to ride with them to Montana to reunite with his former girl. Salvador and his mom help Coyote out of a tough spot right when their car dies, so they join the group. A couple of others join for a spell, including a considerate goat named Gladys. Heartfelt and full of fun too, this book is able to move from silly to touching and bring a tear to your eye. It is aimed at upper elementary to early middle school readers, or for anyone who enjoys a good road trip book about family. Other books by the author include Good Dog, Scar Island and The Honest Truth. Gemeinhart, Dan. 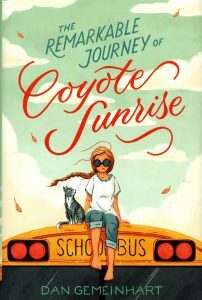 The Remarkable Journey of Coyote Sunrise. Henry Holt and Co., 2019. This is the first question Bailey asks of the snail in her book, The Sound of a Wild Snail Eating, in which she recounts her survival through a debilitating relapse of her chronic illness. Once a traveler and gardener, she is rendered bedbound and alone, save for the occasional visits of loved ones and her caregiver. And then she is gifted the company of a wild woodland snail, brought from its habitat with a friend’s potted offering of wild violets. As it so happens, the snail is alive, and its motion and unique liveliness breathes purpose into Bailey’s stalled life. 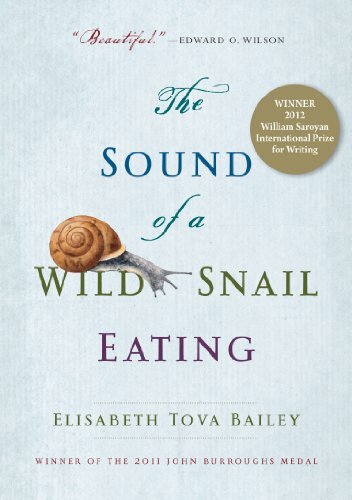 The Sound of a Wild Snail Eating is a small book. Its pages number at 170; 191 if you count the acknowledgements and bibliography. It’s a quick read that gets technical at times but never becomes wholly inaccessible. Its style, complete with pages dotted here and there with monochrome drawings of snails, is a tribute to the 19th century naturalists of whom Bailey seems fond, and she follows in their footsteps – or, rather, to borrow her imagery, she glides along the slime trail they left behind. Bailey draws from scientific literature and poetry in rhythm with her observations, making the book one-part informative essay and one-part ode. Peppered in between discussions of the snail’s locomotion, diet, and evolution are the chronicles of her illness, told in an almost tangential fashion, secondary but parallel to the snail’s life, where she both wishes to be more like the snail and longs to feel human again. Is it alive, she asks of the snail and its stillness during their first introduction. Am I alive, she seems to ask; or, the darker question that lingers, one with an answer she couldn’t know, will I survive this? The Sound of a Wild Snail Eating is best enjoyed in the perfect stillness that might allow oneself to overhear a snail at its dinner. Bailey asks the reader to slow down and ponder – and wonder – at nature and its small, unnoticed creatures and their tiny, significant lives. The reward for your patience is a quiet sort of jubilation and a feeling of hopeful resilience. Bailey invites us to consider the snail and, in doing so, asks if we might also see ourselves. Bailey, Elisabeth Tova. The Sound of a Wild Snail Eating. Algonquin Books of Chapel Hill, 2010. What do our parents really leave us? Is it money, or a house? Seeing my father’s eye’s when I look in the mirror or my mother’s nose? Is it memories, the good and the bad? What if you found your dad wasn’t your biological father? That all the family history, the aunts and uncles, the cousins and grandparents, that they didn’t really belong to you. At least not in the way you thought. 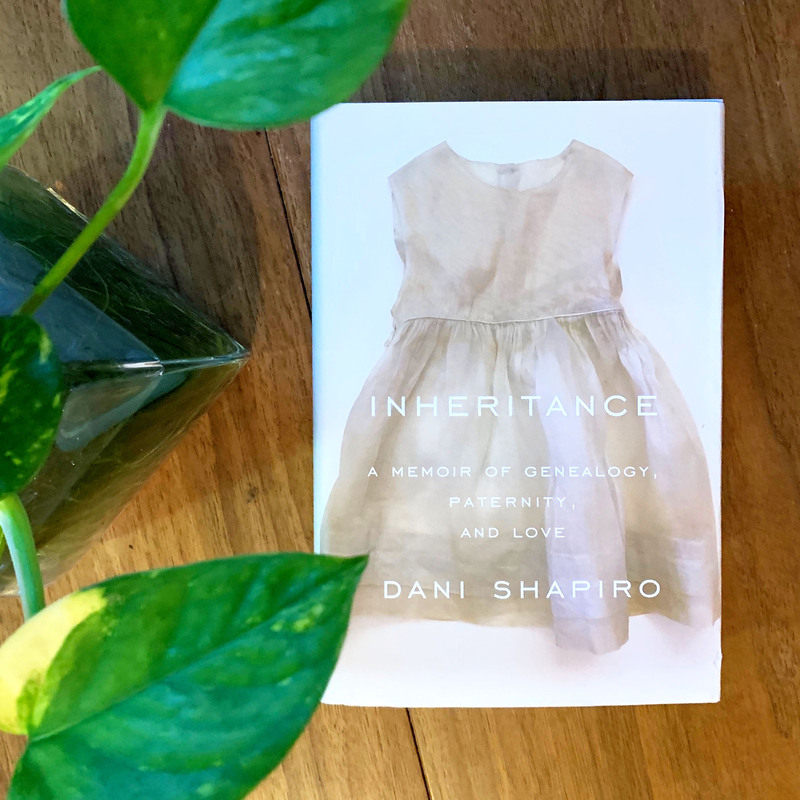 This is the basis for Dani Shapiro’s poignant and timely memoir, “Inheritance: A Memoir of Genealogy, Paternity, and Love.” This is not just the tale of the author’s search for her biological father, but her desire to know the secrets her parents kept. I listened to the audiobook, published by Random House, and narrated by the author herself. Listening to the author tell her own story, hearing her voice and emotion as she recounts the journey she takes after this discovery made the experience even more enjoyable. I choose this book in my attempt to read more non-fiction this year, and it didn’t disappoint. Shapiro, D. (2019). Inheritance: A Memoir of Genealogy, Paternity, and Love. 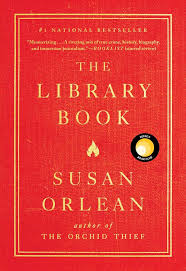 The Library Book by Susan Orlean is a necessary and fascinating read for anyone who has used a library—even more so for anyone who works in a library. Orlean tells the story of the Los Angeles Central Library, its founding and its operation, and about a dramatic 1986 fire and the following investigation. Of special interest to Nebraskans, the building itself was designed by Bertram Goodhue, who was also the architect for another building you might be more familiar with: the Nebraska State Capitol building. The way Orlean tells the story is as interesting as the investigation itself. The book is true crime, history, biography, and homage. She describes her own emotional connection to visiting her hometown library with her mother as a child, and then returning to libraries much later, after having a child of her own, and she begins to appreciate what an incredible societal wonder the modern library is. Orlean also tells the stories of pioneers, free thinkers, and risk takers who made the Los Angeles Central Library possible, like Mary Foy, who became the head librarian of the Los Angeles Central Library in 1880, when men still dominated the field—and when she was only eighteen years old. 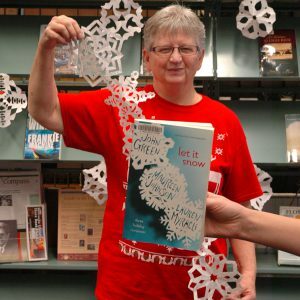 With thoughtfulness and sensitivity, she talks about the emotional aftermath of the 1986 fire, for the workers and patrons of the Central Library, with personalized detail. She addresses the realities of the twenty-first century public library with respect and without sentimentality. I dragged my feet finishing this book, because I didn’t want it to end. I knew from the formatting of the first page—I won’t give away how each chapter is introduced—that I was reading a book about libraries by someone who knew them and loved them. If you’re old enough to remember 1986, but you don’t remember the Los Angeles Central Library fire, it might be because another catastrophic event happened a few days before in Chernobyl, which overshadowed the fire in the news. After you read the book, you might want to watch news clips and video of the time—and view other reactions to the book. The story told by the book has encouraged a reckoning and remembering by those affected, and it is powerful. I took my copy of the book on a field trip to another library designed by Goodhue—in the aforementioned Nebraska State Capitol building. Pretty library photos will be on social media soon, and I will add a link here when that happens. Orlean, S. (2018). The library book. Murderbot (as they call themself) is a part organic/part machine SecUnit (security unit) who is contracted out by The Company to various research and exploration teams traveling to other planets to keep them safe, and to keep an eye on what they’re doing. Unlike other SecUnits, however, this particular one has hacked their own (cheaply made) governor module so they no longer have to follow the Company’s strict protocols. Rather than turning against all humans or anything overly violent, Murderbot just wants to be left alone to watch thousands of hours of sci-fi/adventure soap operas and to do the bare minimum of work (just enough so no one realizes they now have free will). The current job includes a group of humans who are exploring a planet for scientific reasons that don’t matter much to Murderbot. This is a fairly easy job until equipment starts to fail, creatures start attacking, and vital pieces of information seem to be missing which puts the humans all in danger. Now they must find out who is behind the conspiracy and what’s going on, keep the humans safe from other (more heartless) robots, and get them all off of the planet while desperately trying to avoid more social interaction than is necessary. 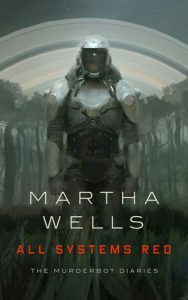 All Systems Red is the first novella of four in The Murderbot Diaries which all follow our snarky SecUnit. Quick reads with fast-paced stories, engaging characters, lots of snarky humor, cyborg/robot/human battles, and tentative friendships. 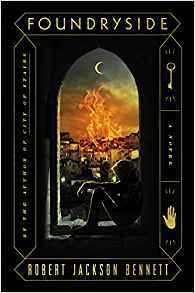 Great world buildings, eccentric characters, and a solid plot that keeps me guessing, will always catch my attention, and Foundryside, by Robert Jackson Bennett has all of that and more. In so many ways it’s also unusual–set in a tropical seaport town, of a world that has seen an apocalypse wrought by an unusual type of magic called “scriving” by the surviving, thriving, inhabitants. The merchant houses of Tevanne, rediscovered the art, and used the power of “scriving” to conquer other cities, create empire, and spy on each other. The tools they create are powerful, arrows that vibrate so hard as they go through the air that they disintegrate; rapiers that accelerate when put into motion, because they believe they’re going so much faster, and can go through tree trunks; and suites of armor that barely need inhabitants to kill. So of course, they create these items, and more, behind their own walls. Each merchant house is nearly a city-state with their own culture. The people unlucky enough not to be born to the houses, or useful to them, live in the commons, the areas outside their walls. Like Sancia, a very good thief, who has a rare ability of being able to listen, and understand the scrivings on objects–floors, walls, and locks. A job comes her way through her fence to steal an item that’s just arrived in Tevanne. Which is when everything goes wrong, of course. The item is a very old, rare, scrived artifact, from the original practitioners of scriving, and talks, in a way. Its name is Clef. And he’s freaked out that she can hear him. She’s very freaked out that he can talk! And life just gets more complicated from there, with scions of merchant houses run amok, scrived humans (which shouldn’t exist), the already slightly crazy practitioners of a fractured art, and a lot of people doing impossible things such as shooting crossbow bolts at our heroes. Included here is an interview with the author on SYFYWire. This boo k has been sitting on my bookshelf, unread, for about a decade. I bought it because a few friends had raved about the life-altering, mind-bending power of this book. Needless to say, I was skeptical. I didn’t say anything back them, but I suspected the only reason my friends enjoyed the book is because they were already in the middle of changing their own lives when they happen to stumble upon the book. 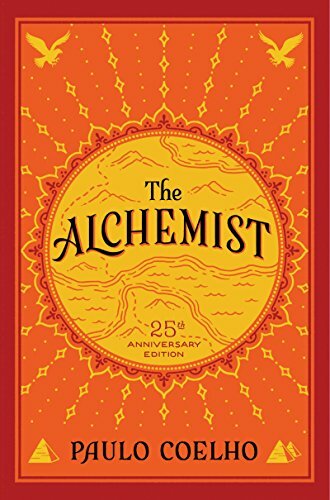 The Alchemist has the ability to pour gas on a lit fire to make the flames explode upward. But it cannot apply spark to the flint over dead leaves. 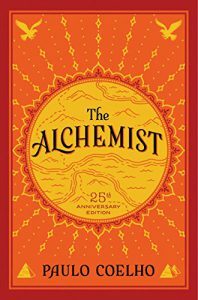 The Alchemist by Paulo Coelho is the story of a young man named Santiago who wants to see the world. He starts out as a shepherd who quietly enjoys what he does. But the endless horizon calls out to him. Thus his journey begins. Along the way, he meets a variety of mystically inclined individual(s) who provide him with endless philosophical advice to drive him towards his own Personal Legend. He winds up in pursuit of treasure near the pyramids in Egypt. It’s a wild ride. When I tried to read this book the first time, I was turned off by phrases like ‘Personal Legend’, ‘Soul of the World’, and other over-the-top phrases. Ten years later, when the book called to me again, I realized that these are just phrases. Depending on your own personal beliefs, you can mentally exchange these phrases for words that speak to you. The book was already translated once from the Brazilian author’s native Portuguese. For me, this book was a way to see myself from a more global perspective. We will all travel through life, meeting different people who will teach us different things. As I learn more about how people in other parts of the world live, I find my own Personal Legend shifting. The small irritations in life don’t seem to matter quite as much. I have food, clean water, access to learning tools, plenty of books, all things necessary to a good life. Why not help those who don’t have access to that already? If you’re ready to change your life, or are open to seeing other ways of life, this could be a good book. It’s a quick read, and can be a great catalyst for change. As you’re reading your own meaning into the book, keep in mind that sometimes the journey is vastly more important than the end goal. Maybe I will pick up this book in another ten years and see a completely different story. Mystery fiction has many subgenres: hard-boiled, cozy, police procedural, etc. One particular subgenre of interest to lovers of books is that of the bibliomystery, and in recent years, I’ve found that I love to read, or listen to, books that fall in this bibliomystery category. If you do an online search you will find many authors that write bibliomysteries. 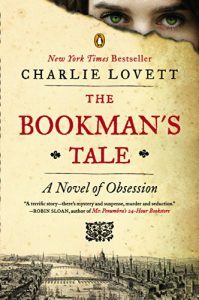 My favorites are John Dunning’s Cliff Janeway series, John Grisham’s Camino Island, Bradford Morrow’s Prague Sonata and bibliomysteries by Charlie Lovett, which leads me to today’s Friday Reads post: The Bookman’s Tale: A Novel of Obsession, by Charlie Lovett. Hay-on-Wye, every bibliophile’s dream destination in England, 1995. Peter Byerly isn’t sure what drew him into this particular bookshop. Nine months after the death of his beloved wife Amanda left him shattered, Peter, a young antiquarian bookseller, relocates from North Carolina to the English countryside, hoping to outrun his grief and rediscover the joy he once took in collecting and restoring rare books. But upon opening an eighteenth-century study of Shakespeare forgeries, he discovers a Victorian watercolor of a woman who bears an uncanny resemblance to Amanda. Peter becomes obsessed with learning the picture’s origins and braves a host of dangers to follow a trail of clues back across the centuries—all the way to Shakespeare’s time and a priceless literary artifact that could prove, once and for all, the truth about the Bard’s real identity, and definitively prove Shakespeare was, indeed, the author of all his plays. 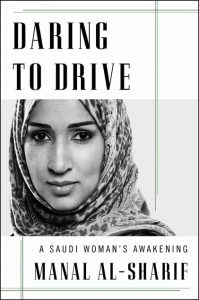 Daring to Drive is the memoir of Manal al-Sharif, a Saudi Arabian women’s rights activist who spent time in prison after participating in the 2011 Saudi women’s driving campaign. While the first two and final four chapters focus on her driving activism, the middle eight are a chronological account of her life, beginning on April 25, 1979, the day of her birth. In my view, the real drama of the narrative is in seeing how al-Sharif transforms from a young girl, strictly controlled by Saudi custom and a fundamentalist version of Islam, to a woman who challenges the status quo at great personal cost. One value in reading an account like al-Sharif’s is the window it provides into the restrictive, brutal nature of Saudi life, especially for women. In Saudi Arabia women are completely dependent on male guardians (usually fathers or husbands) or on mahrams (male relatives whom they cannot marry, such as brothers, uncles, or even sons) to accompany them on any official business. To illustrate her point that in Saudi eyes “death is preferable to violating the strict code of guardianship and mahrams” (7), al-Sharif cites several cases where women died when male paramedics weren’t allowed to treat them because their guardians or mahrams weren’t present. And of course, women couldn’t drive, even if, like al-Sharif, they owned cars and had foreign driver’s licenses. (Note: Authorities finally lifted the ban on women driving on June 24, 2018.) Instead, women relied on, and frequently suffered harassment by, male taxi drivers or “an informal network of men with cars who illegally transport female passengers” (9). For the most part, the cultural landscape al-Sharif describes appears quite alien. Occasionally, though, one feels an uncomfortable flicker of familiarity. For example, on the topic of harassment al-Sharif writes “the authorities . . . always blame the woman. They say she was harassed because of how she looked or because of the way she was walking or because she was wearing perfume. They make you the criminal” (11). al-Sharif’s decision to wear a hijab, which left her face uncovered, instead of a niqab, in public was seen by men as an invitation to shout slurs, like “whore” and “prostitute,” at her. The degree of coverage hardly seemed to matter though, as even a woman who left only her eyes exposed was reportedly told by religious police to cover them because they were “too seductive” (234). So what allowed al-Sharif to reject the shackles of her culture? To achieve a broader perspective on Saudi customs and fundamentalist beliefs? After reading her memoir, I’d say that, in addition to innate curiosity, it was education, internet access, and exposure to people from other parts of the world – exactly the things repressive regimes and conservative religions invested in maintaining the status quo typically fear. al-Sharif grew up with a mother who prioritized education for both her daughters and her son. And even though the schools al-Sharif attended growing up initially fanned the flames of her extremist religious beliefs, her academic achievements ultimately got her accepted to King Abdulaziz University in Jeddah. There, she received a small monthly allowance from the school, which gave her a first taste of financial independence. She also had her radical religious beliefs tested for the first time by fellow students who didn’t follow all the same practices she did. Perhaps most importantly, she signed up for internet access in order to complete and submit her homework. Though her original intent had been to avoid reading anything that might undermine her beliefs, she ultimately couldn’t resist exploring political analysis, world news, and diverse opinions. “Nothing,” she wrote, “did more to change my ideas and convictions than the advent of the Internet and, later, social media” (132-133). Finally, after graduating, her university degree got her a good job at Aramco, the Saudi state oil company, where she worked with not only Saudi men, but also foreigners. In 2009, as part a professional exchange program, she got to live and work in the United States for a year. During this time abroad, she learned to drive, got a New Hampshire driver’s license, and rented a car at company expense. She went skiing and skydiving, got a public library card, attended a play in which two men kissed, learned about Rosa Parks and the civil rights movement, took up photography, and befriended a Jewish woman, none of which she could or would have done in Saudi Arabia. Her year in the United States was definitely a turning point for her; though she went back to Saudi Arabia at the end of it, she returned a completely different person. As she writes, “ the true culture shock occurred not when I landed in America, but much later, after I had returned home” (203). This is when her activism began in earnest. al-Sharif, Manal. Daring to Drive: A Saudi Woman’s Awakening. New York: Simon & Schuster, 2017. Print. I have read many of John Grisham’s legal thrillers dating back to his second book, The Firm (1991). I didn’t read his first, A Time to Kill. I only saw the movie. 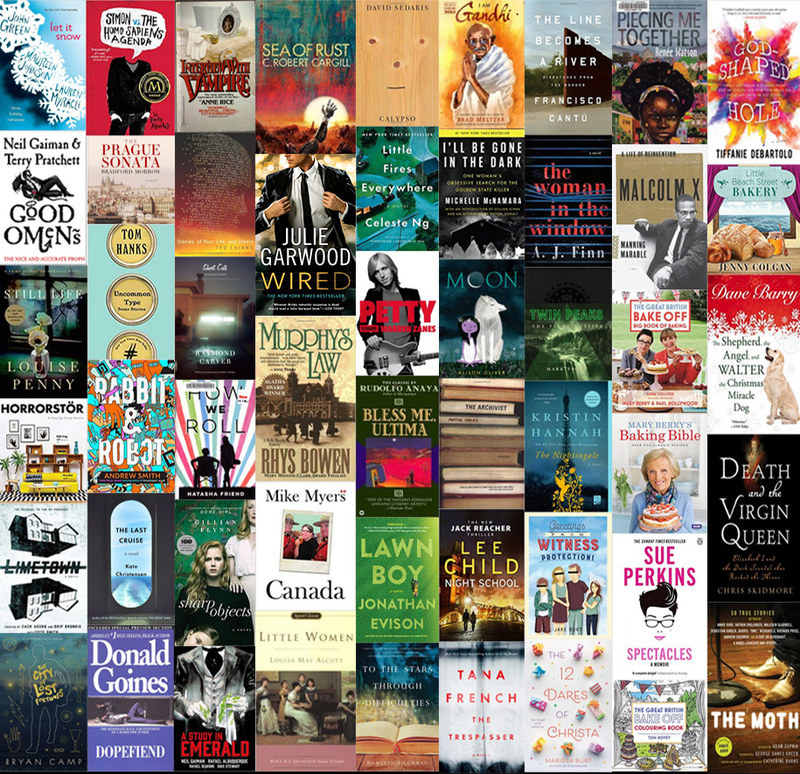 It is admirable that a writer can publish a new bestseller each year, and sometimes more than one. 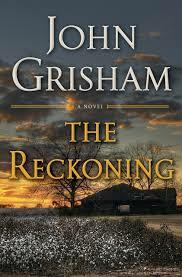 Grisham’s novels now number 41. In addition, he has published short stories, nonfiction, and young adult books. Grisham is a creative and clever writer. His most recent book, The Reckoning, is, to me, among his best. The book is set in 1946 in Grisham’s familiar rural Ford County, Mississippi. Grisham’s experiences there, including an early career as a criminal defense attorney and state legislator, offer informed and useful background for his writing. Pete Banning is the book’s central character – a kind and respected cotton farmer from a prominent family with deep roots in the community. Banning is a West Point graduate, a World War II infantry officer, prisoner of war escapee, and war hero decorated for his leadership and accomplishments as a guerrilla fighter in the Philippines. Thought of as killed in action, Banning’s surprise return home after the war was followed by a shocking criminal act that disrupts his family and the entire community. Banning refuses to offer an explanation for his actions. Why would someone so admired, responsible and respected do what he did? The mystery carries through the book to an unexpected and surprising conclusion. 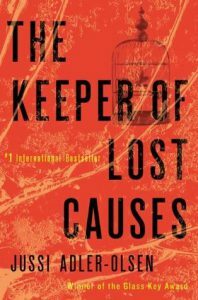 Of the book’s more interesting chapters are those involving Banning’s wartime service with the Army in the Philippines. There is rich, well-researched, detail of the U.S. Army’s actions, the Bataan Death March, prisoner of war experiences, and guerilla warfare. Equally interesting is how Grisham creates his storylines. For The Reckoning, Grisham contends that the story came from those told among state lawmakers, gathered together for evening conversations. Grisham appears not sure whether the Banning story was based on a real or imagined incident. Either way, the story is compelling and will keep the reader turning pages to the surprising ending. Grisham, John. The Reckoning. New York: Penguin Random House, 2018. A little while ago, I had just finished reading The Wrecking Crew: The Inside Story of Rock and Roll’s Best-Kept Secret and I was listening to a story on NPR about music students attending the Berklee College of Music in Boston. Ironically, the story highlighted current student musicians that were contributing to the music world in a way quite similar to the wrecking crew of the 1960’s and 1970’s. You see, the original wrecking crew was a collection of backup (or maybe background would be a more appropriate word) musicians that played on numerous studio recordings. Like the Berklee music students, the wrecking crew played on jingles, theme songs, film scores, and commercials (the Berklee students have expanded to playing music for podcasts, video games, and other things). So The Wrecking Crew documents the lives of these studio musicians, how they started and expanded in the business, and their interactions with some of the writers, producers, arrangers, and other notable artists. These include, among others, Brian Wilson, Sonny and Cher, Simon and Garfunkel, John Lennon, Frank Sinatra, and the Mamas and the Papas. While one of the more well-known members of the crew was Glen Campbell (who also toured as one of the Beach Boys), the book also focuses on drummer Hal Blaine and guitarist Carol Kaye (shown here hilariously giving Gene Simmons a lesson on bass). Incidentally, the name wrecking crew, penned by Hal Blaine, is disputed by Carol Kaye, who mentions that the group of musicians weren’t generally known as such (but sometimes called “the Clique”). Call them whatever you choose, but this set of musicians were the go-to’s when it came to studio recording, and the point is that the work was good enough for them to earn a living doing it. Most of the recorded music you hear from this time has these musicians playing on it instead of the actual bands that toured. And the kicker is that you would never know it; most of the time (if not all of the time) they weren’t credited. The book also offers an interesting insight into many of the colorful (both in a healthy creative way and sometimes controlling and abrasive) characters in the music world at the time. For the creative but meticulous, think Brian Wilson. For the controlling and abrasive (and sometimes downright crazy), think Phil Spector. The Wrecking Crew offers access into not only these major artists but also those behind the scenes. A documentary film about the Crew, based on the book, may also be of interest (some of the original footage illustrates things in a worthwhile way). Hartman, Kent (2013). 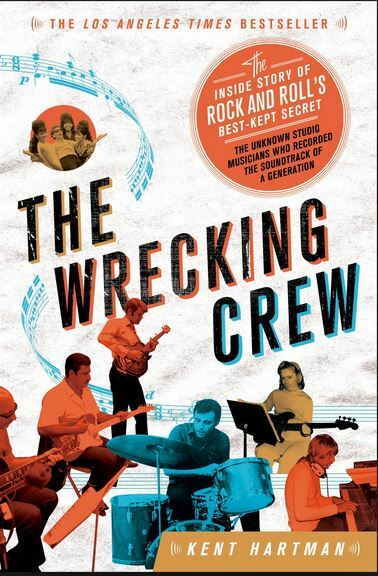 The Wrecking Crew: The Inside Story of Rock and Roll’s Best-Kept Secret. St. Martin’s Griffin. My most vivid memory of second grade was trying to read a Sweet Valley Twins book under my desk during class, only to get caught and kept in from recess. This may have happened multiple times (sorry, Mrs. Wade). 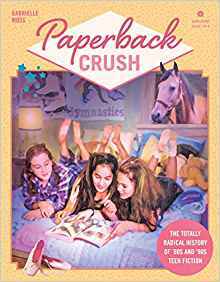 From the ages 8 to 12, I heavily favored the sort of books that Gabrielle Moss revisits in her new history of tween and teen fiction from the 1980s and ’90s, Paperback Crush. Flipping through this book was a fun trip down memory lane, with stops along the way in Stoneybrook, CT, Sweet Valley, CA, and Shadyside, OH. Was it classic literature? Not in the slightest. But I would stalk the shelves of my local library or mall bookstore, just waiting for the latest installment of my series-du-jour. I was surprised at how many titles/series I had forgotten about over the years. Sleepover Friends and Girl Talk, The Face on the Milk Carton, 2 Young 2 Go 4 Boys; their plots had obviously wormed their way into my subconscious, judging by how many clubs I convinced friends to form and how fascinating the idea of having a twin was to tween-age me. Moss has broken down the 80s/90s teen fiction genre into 7 broad themes (love, friends, family, school, jobs, danger, and terror) and covers the most popular books for each theme, and the knockoffs they inspired. Teen fiction during this time period certainly had its flaws: lack of diversity, corny plot-lines and cheesy cover art, neatly wrapped up endings, but it also fueled the girl-power movement and sparked a lifelong love of reading for many of us. These girls could do anything – take on the school bully, run for class president, deal with an annoying brother or divorcing parents, fight vampires… Interspersed throughout are interviews with authors such as Rhys Bowen, Caroline Cooney, and Christoper Pike, as well as a timeline of teen lit from the turn of the 20th century until more modern times. If you ever started your own babysitter’s club, or asked yourself if you were an Elizabeth or a Jessica, I would recommend spending a couple of nostalgia-filled hours with this “totally radical” history book. Moss, Gabrielle. Paperback Crush. Philadelphia, PA : Quirk Books. 2018. If it’s the end of the year, then it must be Hogswatch! But, the Hogfather is missing! How can we have Hogswatch without him? Not to worry, Death is here to save the day, filling in for him so that all the children will still get their gifts. What could possibly go wrong? Hogfather is the 20th book in Terry Pratchett’s Discworld series. And it’s one of the most entertaining, in my opinion. If you haven’t read any Discworld books yet, that’s OK. This one can be read on its own. There’s enough detail and explanation to understand what’s happening. But, for those of you new to this series, Discworld is a magical world, filled with witches, wizards, dragons, trolls, and dwarfs. Physically, it’s a flat disc, sitting on the backs of four enormous elephants, which are standing on the back of an enormous turtle slowly swimming through space. You will recognize some similarities to our world, but since it does have magic, things are quite different. It’s almost Hogswatchnight, and while Death is keeping up with some of the Hogfather’s duties, there’s still the problem of what happened to him. Luckily, Death’s granddaughter Susan is also on the case. While Death is trying to ensure that people will keep believing in the Hogfather, she’s trying to find him. It turns out that there will be more serious problems than a lack of gifts without a Hogfather. Belief in him also happens to be important to keep other parts of the world working properly. In order to save the Hogfather and Hogswatch, Susan must deal with the “Oh God” of Hangovers, interfering wizards, the realm of the Tooth Fairy, and Mister Teatime, an assassin who insists that his name is pronounced ‘teh-ah-tim-eh’. 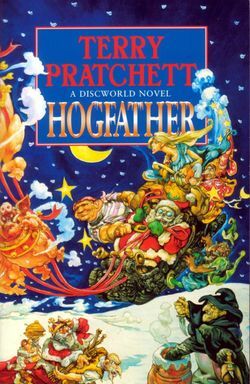 As with all of the Discworld books, Hogfather is both a comic fantasy and a satirical commentary on our world. But, this novel also deals with the nature of belief and how important it can be to us, whether we realize it or not. It’s the kind of book you will need to read more than once to absorb the depth and meaning of the storytelling. If you’re looking for a really fun seasonal read that will restore your faith in humans, Hogfather is the book for you. HAPPY HOGSWATCH! Pratchett, Terry. Hogfather. New York: Harper, 1996. Three stories, or novellas, by three different authors are interconnected in a satisfying way and will appeal to teens and adults. The first story is “The Jubilee Express” by Maureen Johnson. It is about Jubilee (or Julie when she doesn’t want to explain her name) and her sudden, unexpected trip to Florida to visit her grandparents. En route she is stranded in Gracetown when her passenger train runs into a pile of snow during a Christmas Eve blizzard. It makes sense to leave the train for the warm, inviting Waffle House just in view. “A Cheertastic Christmas Miracle” by John Green is the second story. Tobin will spend Christmas with his two friends as his parents are stuck in Boston due to the blizzard. Then another friend calls from the Waffle House that there are 14 cheerleaders there from the stranded train and a couple more guys are needed (but not too many more!). The third story, “The Patron Saint of Pigs” by Lauren Myracle tells of Addie, who recently cheated-on and felt she had to break-up with her boyfriend, and is in despair. Her two best friends are not letting her dwell in her misery and insist she try to think of others instead of just herself. So she decides to be someone else’s “angel” as penance for her mistake. Does this sound like a good choice to you? This is a title you can find in our Book Club Kits. Reserve it for your book club for something light, yet also substantial. Green, John, Maureen Johnson, and Lauren Myracle. Let It Snow. Speak, 2008. I recently ordered a copy of Good Omens, which arrived in my mailbox dingy, awkwardly sized, and with an atrocious “SOON TO BE A TV SERIES” sticker that turned out to not be a sticker at all, but rather a circle printed onto the cover itself like a mosquito trapped in amber — the point being, the book arrived not at all like I had hoped, but rather in a manner that oddly suited it. Like an old, eccentric friend skidding to a stop right at your front-door: slightly out of breath, bedraggled, and altogether entirely welcome. 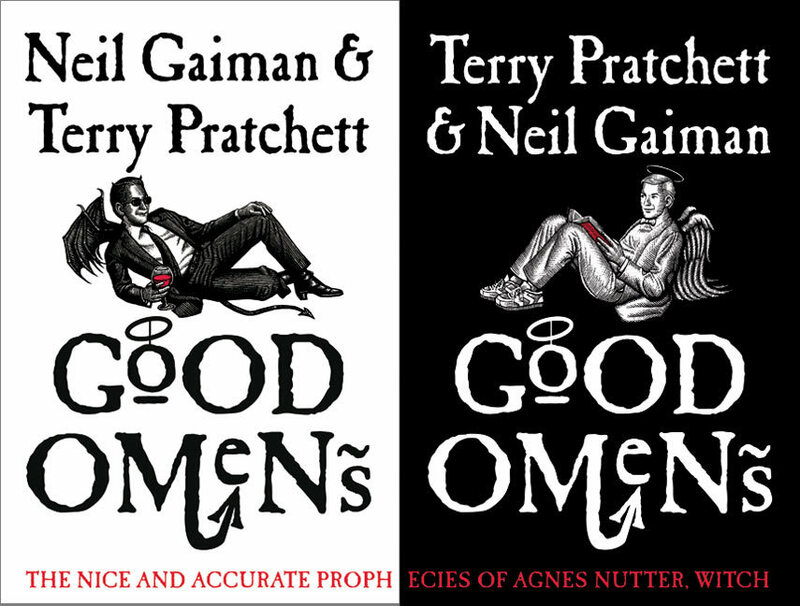 Good Omens brings together an entire cast of Dramatis Personae to enjoy, but three of the central characters are Crowley (“an Angel who did not so much Fall as Saunter Vaguely Downwards”), Aziraphale (“an Angel, and part-time rare book dealer”), and Adam (“an Antichrist”), all of whom are supposed to bring about the End of the World according to The Plan, but all of whom don’t really want to. Neither Crowley nor Aziraphale, having forged a strange friendship dawning back to the Fall of Man, fancy an eternity of The After run exclusively by either demons or angels. Plus, they’ve developed a sort of attachment to humanity and all of its wonderful imagination. And as for Adam, well… what eleven-year-old wants to do what he’s told? This is a whirlwind delight of a book; though at times its snappy, quick-witted prose can create as much confusion as it does charm. It’s a book that you would be tempted to read quickly (and can), but you may find yourself (like me) having to go back and carefully reread certain passages. It took me a few attempts to comprehend the baby-swapping that occurs in the beginning. It doesn’t help that a collaboration between two prolific British authors tends to be quite…British, and although the authors’ inclusion of footnotes helps, eventually an untraveled American may need to give up on recognizing where anything is taking place. It’s a rollicking, reverently irreverent mashup of The Hitchhikers Guide to the Galaxy and The Holy Bible; a humorous high-energy (oc)cult classic that might end up making a profound point about Life and all that. Gaiman, Neil, and Terry Pratchett. Good Omens. Harper Collins USA, 2006. I’ve been working my way through this series for that last year or so, and I’ve yet to be disappointed by one of these books. 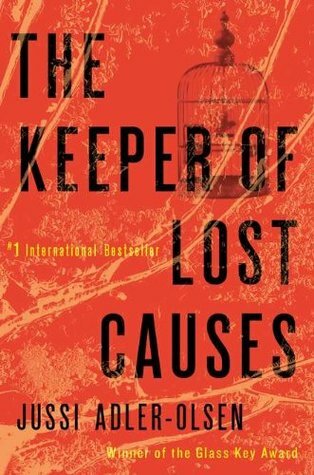 There were several reasons that drew me to the first book; I was deep into a crime/mystery reading phase, but was feeling burnt out on over-the-top violence and gore. 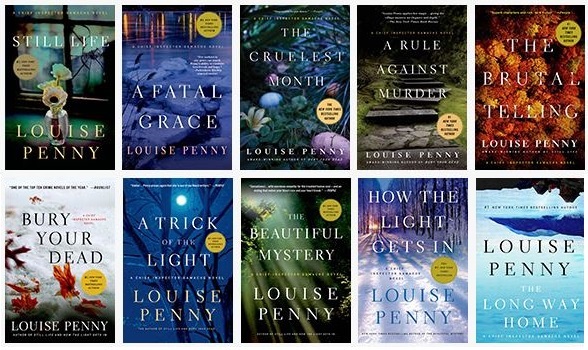 I wanted something still in that genre that wouldn’t keep me up at night, and I found it in Louise Penny’s cozy mysteries. Set in Canada, the series follows aging Chief Inspector Armand Gamache of the Sûreté du Québec as he thoughtfully solves murders for their famed homicide division. Still Life (2005), the first in a what is now a series of 14 (I’m only up to #9 myself) introduces you to a collection of characters that continue to evolve throughout the series. I especially appreciate the main character, Armand Gamache. he’s not your standard police detective, he’s not the bitter and cynical trope that we see so often in this genre. I’ve also discovered that the audio versions are delightful. The narrator, Ralph Cosham, is exactly what I imagined Armand’s voice to sound like, and the smattering of French through out the books is done equally as well. These books are the perfect winter read. They’re the kind of books I want to hole up with, wrapped in my favorite cozy blanket and a mug of hot cocoa. 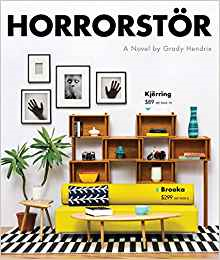 Horrorstor is a fun, quick read, perfect for the holiday shopping season. It’s a horror story, set in a big box store, formatted to look like a catalog. Author Grady Hendrix has seen a lot of horror movies, and if you have too, there are references aplenty for you to enjoy. He’s also spent a lot of time in Ikea (and does name-check them, as the superstore Orsk is knockoff of the Swedish retail giant) and has a lot of fun with the names of products accordingly. The book has just enough digs about consumer capitalism to make you feel smart, and enough broadly-drawn but relatable characters to make you not dwell on anything too downbeat. The book would make a good gift, for the reader with a sense of humor on your list. (Or a library book to check out and have in the house, for the family introvert during a holiday gathering.) Are there plot holes? Yes! Is it a masterpiece? No! Is it enjoyable? Definitely. Can you read it surrounded by family being loud, with every TV and speaker in the house on a different channel, while full of sugar? Yes. You’ll still be able to follow the story. You’ll root for the employee character of your choice to make it through the single overnight shift in the possibly haunted, definitely scary Orsk location in Cuyahoga, Ohio, built on the site of an abandoned experimental prison, the Cuyahoga Panopticon. The narrative design is a lot more straightforward than any big box store design. The author is having a good time, and he wants the reader to have one, too. Hendrix, Grady. Horrorstör: A Novel. Philadelphia, Pa: Quirk, 2014. Print.